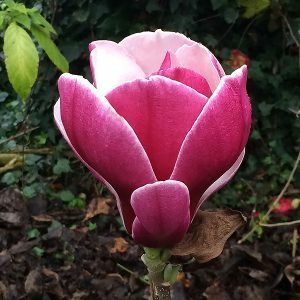 With large deep red flowers, this deciduous Magnolia lives up to its name, Magnolia ‘Ruby’. The flowers have petals that are a deep ruby red on the outside. Cup shaped they hold well on the plant into mid spring. It is the beautiful contrast of the red and near white reverse flowers of Magnolia ‘Ruby’ make this one of the most attractive of the red flowering varieties. The new buds are particularly attractive as they open, deep red with the edge in white. Flowering in early spring, the flowers are deep pink on the outside with a near white on the inside. Individual flowers appear on bare stems and are help nicely upright. The flowers have a slight fragrance, a lemon scent is the best description. Foliage which appears after the flowers is a good glossy green, the plant itself has an upright to slightly spreading habit. Over time Magnolia ‘Ruby’ will get to around 5 metres in height with a spread of around 4 metres. It is a variety that is easily pruned to shape, so it also suits smaller gardens and could be container grown. It makes an excellent small feature tree for a medium to large sized garden. This is an excellent feature tree for smaller gardens. plant it in an open position where the flowers can be shown off to best effect. Height – Will reach 5 metres over time, easily pruned to 2 – 3 metres.